Queensborough, Samuel Scott, 1772, National Maritime Museum. 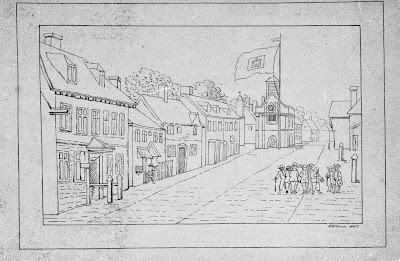 A simple illustration of a short main street, this was part of a series of illustrations by Samuel Scott for the "The Five Days' Peregrination" by Ebenezeer Forrest. 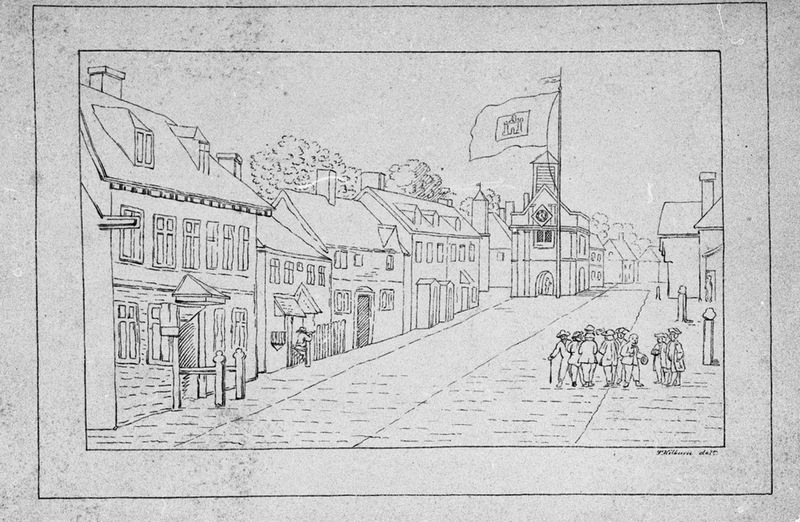 Interestingly, Scott was not the only illustrator: none other than Hogarth himself created a few pieces for the work! Scott is known for his maritime art, a great deal of which is in the collection of the National Maritime Museum. Most of these works are of ships in combat, fighting storms, or engaging in the everyday routine of seaborne merchants and fighting men. This is why "Queenborough," though not terribly detailed in the depictions of its sailors, is valuable. As an artist irrefutably familiar with ships and the sea, almost certainly avoiding the exaggerations of patriotic prints and political cartoons, how did Scott see the common men on whom captains relied? On the far right are a pair of gentlemen, each wearing long coats, cocked hats, and breeches. To their immediate left stands a sailor, cap in hand, with a hand by his chest, perhaps imploring them for money. He wears trousers that fit close to his legs and end just above the ankles, as well as a single breasted jacket. His mates mostly wear cocked hats, and though the details are scant, it appears the points are forward. The two who give us the best view of their backs are wearing jackets with a single vent at the center back. All of them are wearing trousers sewn in the same fashion as their beggarly messmate.